Many people have asked me why I have chosen to go with an e-pub for the release of Freefall. Good question! First: I was very impressed with their upfront, full-disclosure attitude–their contract is published right on their site for all to see! Second: I heard from fellow authors how supportive Musa is with their authors, from the creative end, through the book formatting, and especially into the promotion. The directors at Musa believe in helping to build an author’s career. I have to say, those fellow authors are right! I get great support from the Musa family. Third, why an e-pub? Because I truly believe that the future of publishing is already here in e-publication. I see people everywhere reading on their ipads or nooks or kindles. They tell me how easy it is to read on them, and to get another book when they’re done with that one. Fourth: Musa is into acquiring some really good books! So, there you have it! To read more about Musa Publishing, please click HERE. 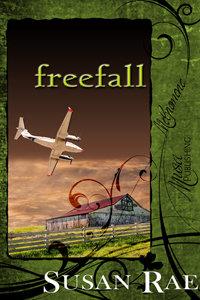 Freefall is now available from MusaPublishing.com and on Amazon.com! On the eve of it’s release, Kate and Everett were interviewed on the Musa Blog. I’m reposting here for my fans to enjoy! Thank you both for coming to chat with us today. Why do you think Susan Rae chose you to represent her? Everett: Honestly? She had a golf date. She said something about a league she was in. She’ll probably drop by later, though; I believe she’s off the course by noon. Then I’m heading out there! Kate: She also said she’d already done her job and now it was up to us to tell our story. Well, that makes sense. Why don’t we start by you telling us a little about yourselves? Tasty Tuesday— I recently had the chance to share this recipe on the Musa Publishing blog. I thought I would repost it here for my followers to enjoy! The DeLuca’s are the strong Italian cop family in my novel, heartbeats. Like most Italian matriarchs, Mama DeLuca is an excellent cook. Easter Bread is just one of her specialties. Easter bread is actually a special family size calzone that is called Easter Bread because it is baked and served mainly at Easter. This takes a bit of time to put together, but it is well worth it. The aroma alone while it is baking will make your mouth water. Enjoy! Want to know more about the DeLucas? Please check it out at MusaPublishing.com or Amazon.com.